Leaf blowers, as shown in Figure 1, are designed to make quick work of cleaning your yard. 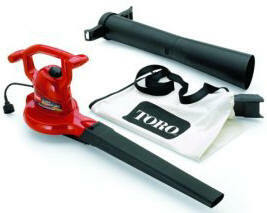 Here are some tips for what to look for when shopping for a leaf blower. Leaf blowers or power blowers can be battery powered, electric or gas-powered machines that help you deal with fall's seemingly endless onslaught of leaves and other yard debris. Today's versions run more cleanly and quietly than before as manufacturers respond to tough emissions and noise rules at the municipal, state, and federal levels. More-stringent exhaust-emission regulations set by the California Air Resources Board, whose environmental initiatives often point the way for the rest of the country, are the latest example. Called Tier III, the new standards, which took effect in 2006, mandate a 30 percent reduction in emissions compared with the standard in effect in 2005. The two-stroke engines that power most gasoline leaf blowers also produce 90 percent fewer exhaust emissions than they did in the mid-1990s. Ever been bother by the irritating whine of a neighbor's blower? Then you know how annoying they can be from afar. Many of today's blowers address the noise problem with baffled exhaust systems to make some models as much as 75 percent quieter than older models. In spite of these emissions and noise measures, blowers--especially gas-powered versions--still aren't welcome in many places. More than 20 California cities have outlawed the use of blowers because of the noise they create. Municipalities in North Carolina and Oregon have set strict noise limits for blowers. And Yonkers, N.Y., is considering a ban on gas blowers during summer months because of the noise and emissions they produce. Don't be blown away by wind speed. Wind speed, measured in miles per hour, is useful for dislodging clumps of leaves around bushes. While big numbers sound impressive, tests indicate that a more meaningful measurement is how much air is moved, measured in CFM. High-rated blowers typically shoot out upward of 300 CFM, making them more effective at gathering and moving big piles of leaves. Check the nozzle shape. A round nozzle is best for cleaning and loosening debris; oblong and rectangular nozzles are better for moving or sweeping leaves. Go electric. Electric models, which now slightly outsell gas models, are sufficient for most homeowners. But remember, electrics aren't suitable for big lawns. Wear it or wheel it! If you have a large, wooded property, you might want to consider a backpack or wheeled model, since they are the most powerful. Keep in mind, though, that the beefier the blower, the more noise it generates and the more emissions it spews.